What Do You Know About Stainless Steel Lunch Boxes? Lunch is a meal that many people often overlook. This is generally not good. Lunch is an extremely important meal that can alter the course of your day. It serves as a branch between breakfast and dinner, two of the largest meals of the day. Eating lunch on a regular basis can also keep your metabolism proper, as well as ensure that your body is getting the nutrients that it needs. Eating lunch can help you do better at work or school because your brain is getting the necessary nutrition it needs. There are also some smaller benefits to eating lunch regularly, as well. Eating lunch can give you the opportunity to socialise with other people as well. Socialising and cultivating relationships is extremely important for any work or school environment. However, if your lunch is not properly stored, it can ruin your day. One of the ways that you can ensure that your lunch is being stored properly is to keep it in a lunchbox. Stainless steel lunch boxes are growing in popularity for many reasons. Stainless steel is quite literally steel that is resistant to stains and rust, as the name suggests. This specific type of steel contains chromium, which is where it gets its “stainless” descriptor from, since chromium is resistant to stains and rust. This makes it a perfect material to make utensils that relate to food, as you will be able to use them over and over without having to worry about potential stains. Cutlery and lunch boxes are two of the most common places that stainless steel is used. Lunch boxes can benefit quite a bit from stainless steel, as well. 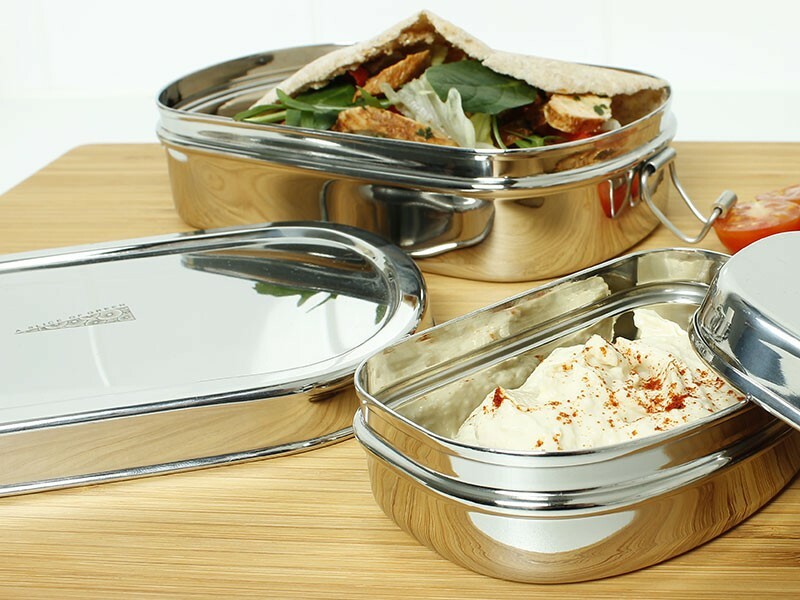 Alongside being stain resistant, a stainless steel lunch box is reusable, as well as easy to clean. You can either clean it by hand or stick it in the dishwasher and it will be ready to be used again. Stainless steel is environmentally friendly, as you won’t need to use cleaning materials to remove stains. That being said, stainless steel is also incredibly versatile. This means that there are several different types of lunch boxes that are available. What Types of Stainless Steel Lunch Boxes Are There? In addition to your traditional box, there are many different types of stainless steel lunch boxes. There are some lunch boxes that take on a bento-style form. This style of lunch box originated in Japan and has quickly spread around the world for good reason. Bento-style lunch boxes are incredibly convenient and versatile. There are some that offer several compartments for you to put different types of food in. Others will have multiple tiers, allowing for different parts of your lunch to be stored in other areas. The various compartments in a bento-style lunch box not only allow for variation in your lunches, but they can also help you with portion control. Portion control is extremely important, especially for people who are conscious about their food intake. This particular style of lunch box is also much easier to transport, store, and clean, making it perfect to bring to school or office lunches.